Is it okay to take creatine when you’re eating keto? Yes it is, and you definitely should! It’s been one of my go to keto supplements since I started eating this way. Everyone else I’ve introduced it to benefits from it too. Here’s why creatine is a great supplement for all of us who are starting to eat keto/low carb. When you first cut out carbohydrates from your diet it’s common to feel a little weak and tired, especially in the gym. This is often referred to as the low carb flu. This physical and mental fatigue is especially noticeable during brief, intense sets of exercise like lifting weights and doing sprints, jumps, etc. When I first went on a ketogenic diet I felt so weak I’d often cut my workout in half and decrease the weight I was using. Then I decided to start taking creatine again. After about 3-5 days I was back to training like normal. One of the primary ways creatine supplements help us is by giving your body more of the energy it needs to perform repeated short, intense bursts without becoming fatigued. This isn’t the only way Creatine can benefit all of us who eat keto and train hard. Listed below are several other ways it will help your body and brain. Studies show it may boost your ability to think quickly and do better on intense mental tasks. This can help with brain fog initially experienced when you cut carbs from your diet. Creatine can help build more muscle even when you’re eating low carb. Gains of 2-3 lbs. of muscle after a week to 10 days is not uncommon. It can also help you get stronger even when you’re cutting back on carbs and calories. Recovery during your workout won’t be compromised like it can be when first adapting to a keto diet. 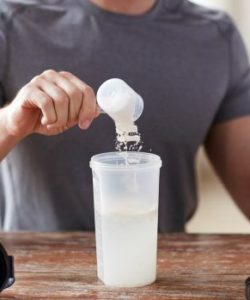 Research finds creatine can also help prevent cramping during exercise, a common problem when you first go low carb. Will Creatine Kick Me Out Of Ketosis? No. Creatine doesn’t affect your blood sugar or insulin levels in a way that cause your body to stop using fat for your energy needs. I’ve tested myself and find that taking creatine doesn’t have a negative impact on my being in nutritional ketosis. Creatine may actually help you get into fat burning mode faster since it allows you to exercise harder, longer. Research finds that exercise helps you deplete the carbs stored in your muscles and get into nutritional ketosis more easily. Bodybuilders have done this for years when preparing for competitions. I’ve taken creatine supplements for as long as I’ve been on a low carb, high fat diet and find that it really helps. My progress with my workouts doesn’t suffer and I feel it helps me continue to train intensely, 7 days a week. Who Should Take Creatine On A Keto Diet? If you’re eating keto with the goal building a lean, strong, body that performs optimally in and out of the gym you can benefit from creatine. This is true for healthy men and women of all ages and fitness levels. Studies show it helps men and women ranging in age and ability from college athletes to sedentary senior citizens. 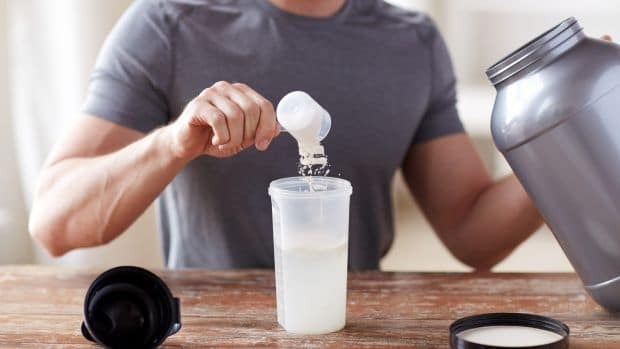 How Should I Take Creatine When I’m Eating Keto? You don’t have to do anything different than you normally would. Science shows the way to get the most from it is to first follow a loading phase to ‘fill up’ your muscles. This lasts about a week. Once you finish loading your muscles, you can cut back to a single dose every day. Its benefits will continue as long as you are taking it daily. Here’s the specifics on how to take it properly. Which Creatine Supplement Should I Use? You’re will always get the best results using a product that contains nothing but pure creatine monohydrate in every scoop. Sure there are other products loaded with sugars but that’s out of the question when we’re eating keto. The additional benefit you get is negligible anyway so don’t sweat it at all. The same goes for supplements that use or include creatine ethyl ester (CEE), Creatine HCL, or liquid Creatine in their formula. Studies show that none of these supplements work any better than good ‘ol Creatine Monohydrate. In all honesty, they’re not shown to work at all (link). When choosing a Creatine Monohydrate supplement also make sure it’s micronized. This means that it’s been ground into a very fine powder. It mixes easier and stays dissolved much better than regular Creatine powder. This makes it easier to drink and ensures that every grams possible gets into your muscles instead of stuck to the side of your glass. The product I use and recommend is Nutrakey Micronized Creatine Monohydrate. Here’s a breakdown as to why I think it’s the best. 100% pure Creatine Monohydrate in each scoop. Made in the USA and tested to be free of impurities. 200 servings per container. This is enough to last 2-3 months. Milled into a micronized powder so it mixes easily and stays dissolved. You can learn more about it by reading my in depth review. Becque MD, Lochmann JD, Melrose DR. Effects of oral creatine supplementation on muscular strength and body composition.Med Sci Sports Exerc. 2000 Mar;32(3):654-8. Buford T, Kraemer R, Stout J, Greenwood M, Campbell B, Spanish M, Ziegenfuss T, Lopez H, Landis and Antonio J. International Society of Sports Nutrition position stand: creatine supplementation and exercise. Journal of the International Society of Sports Nutrition 2007. 4:6.